At the 2013 International Consumer Electronics Show in Las Vegas today, Microsoft, Crystal Dynamics and Square Enix unveiled the Xbox 360 TOMB RAIDER™ Limited Edition Wireless Controller – the perfect commemorative companion marking Lara Croft’s return to the Xbox 360® video game and entertainment system from Microsoft. Developed in collaboration with artists at Crystal Dynamics, the design of the controller features a two-layer color finish with laser etching to create a realistic and tactile worn appearance inspired by Lara’s iconic climbing axe and the tourniquets that result from the adventure in her intense origin story, as told in this latest title. The controller also features a customizable D-pad that switches from a “plus” design to a “disc” pattern for better control, and a wireless range of up to 30-feet that allows for more freedom in your home environment as you explore and play the game. In addition, those who purchase the Xbox 360 TOMB RAIDER Limited Edition Wireless Controller will receive a download token for an Xbox 360 exclusive playable TOMB RAIDER character. The controller will be available timed to the launch of the game worldwide and is priced at $59.99 (U.S. ERP). Available beginning March 5, 2013, built from the ground up for the Xbox 360 and featuring add-on content which will be available first on the platform, TOMB RAIDER explores the intense and gritty origin story of Lara Croft and her ascent from a frightened young woman to a hardened survivor. Armed only with raw instincts and the ability to push beyond the limits of human endurance, Lara must fight to unravel the dark history of a forgotten island to escape its relentless hold. In the all-new TOMB RAIDER a survivor is born. In the comments below, post what your favorite ‘Tomb Raider’ video game is and why. 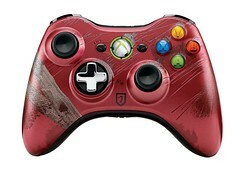 I’ll then randomly choose FIVE people to win an Xbox 360 Tomb Raider LE Controller. Note: If you do not have an e-mail address or Twitter name associated with your Disqus login, you must include your Twitter information in your comment to be eligible. Any winner who does not respond to my notification within 72 hours will forfeit the prize. For faster notification, follow me on Twitter where I can DM you if you won.